Another opportunity to hike in Zion today. After last weeks test of hiking without a flare up of my plantar fasciitis, I decided a slightly longer hike and a minor summit peak would be nice. I would never have considered Mind’s Eye to be a peak and it certainly isn’t a ranked peak by any stretch of the imagination, but it makes for a nice loop along a stunning slot canyon. Just past the long 1.1 mile tunnel on the eastern side of Zion National Park, just past the overflow parking for Zion Lookout trailhead is a wide spot in the road where a sizable wash goes under the road. This is Pine Creek. If nothing else it is worth the hike down into the wash just to look at the stone cut culvert that goes under the road. Build in the early 1900’s it is a stunning piece of craftmanship. Hiking up Pine Creek I marvel at how much the wash has changed in the years that I have been hiking. What used to be a sand filled wash wall to wall is now littered with stones, and a single log braced between walls is becoming a major log jam. 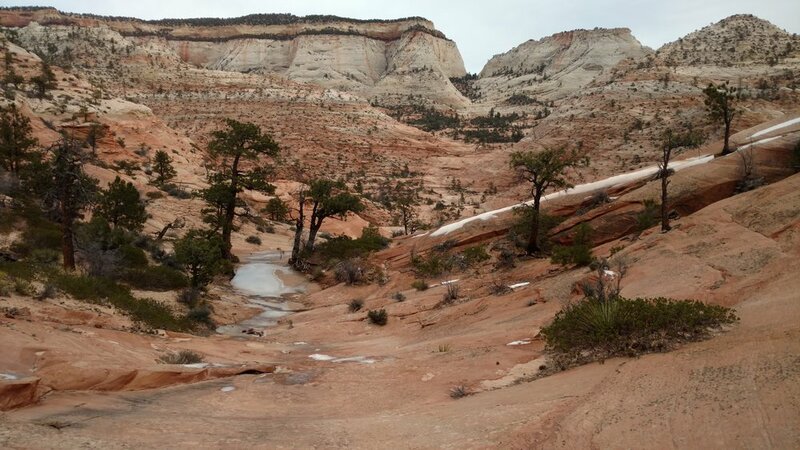 Some deep sand pits with standing water continue to shape the canyon with every rainy season. Toward the end of the hikeable portion of Pine Creek a dryfall enters on the hikers left. A cairn marks the trail and this dryfall is the route to follow for many slot canyons in and around Twin Brothers and Mountain of the Sun. I turn left and angle my ascent toward the high ridge line with separated the current slab I’m on from the major wash coming off of East Temple. It’s not visible now, but a short but deep canyon sits between me and the East Temple wash. The stunning thing about the canyon is an ability to walk around the head of the canyon, behind a large pine, and across a slickrock ledge to get to the other side. This traverse alone around the headwaters of a slot canyon is unique in and of itself, and makes this particular hikes one of my favorites in the area. Shelf Canyon runs to the road and is considered an easy stroll. I’ve never hiked up into the canyon, but the small rise on the left side wall is called Mind’s Eye. I hike along the ledge and up into the wash coming off of East Temple. 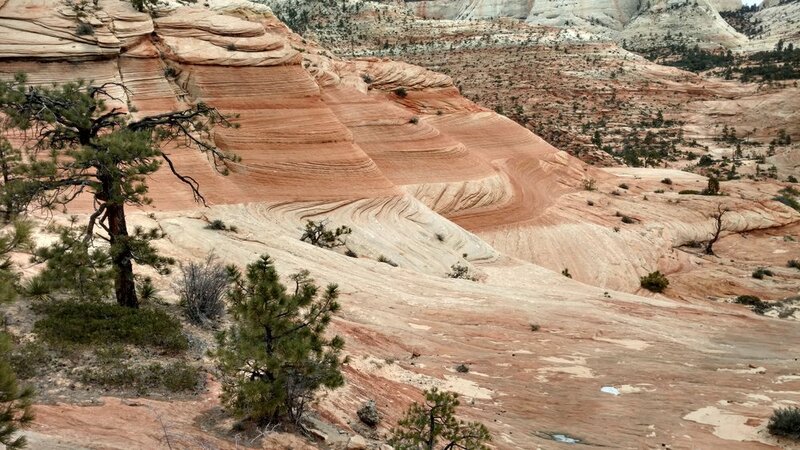 I love this section of the wash as it is filled with interesting hoodoos and stunning views of Progeny Peak and other east Zion canyon peaks. I don’t have a plan for today other than to enjoy the views and relax in the backcountry. I wander up the wash and take a few pictures. Snow is clinging to the north face of the mountains and ice covers any water found in the pockets of stone. I take a few pictures and walk back to the edge of Shelf Canyon for lunch. I enjoy lunch sitting on the ledge of Shelf Canyon, the sky is slightly overcast with the occasional bright sunshine working a path across the opposite stone peaks. It is stunning. The air is clear and the noise is muted. With only a handful of cars it makes this time of year my favorite time to be in Zion. After lunch I make my way around the head of Shelf Canyon once again and hike along the eastern slick rock ridge. I negotiate a few small and minor cliff bands to arrive at the “summit” of Mind’s Eye. I didn’t know it at the time, but my prior journal entry for an ascent was 2017-12-30. Must be something about hiking here in December that I enjoy. I continue off the southern face of Mind’s Eye working the various wash and animal trails until I arrive back at my vehicle. Two additional cars have joined me since I parked, but I have not seen anyone on the hike.